Just before the new year I went to see A Star Is Born with two friends. Alternately we take turns and this was not my choice, but I certainly did not mind going there. 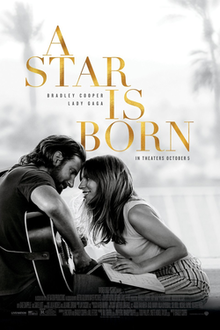 The verdict is an easy one: A Star Is Born is a good movie around a by now well known theme. I am certain I saw at least two of the three previous versions. Barbra Streisand and Kris Kristofferson in the 70s and the older one on tv around the same time. Lady Gaga or Stefani Joanne Angelina Germanotta as she is known to her parents, scored many hits in the past 10 years or so. Not my kind of music, that much is clear. The funny thing is I only know her from pictures in which she wears outrageous costumes and/or hairdo. I would have walked past the girl in the movie 10 times out of ten, not knowing for the life of me what Lady Gaga looks like in a normal situation. Hence it was not difficult to see her in the role of waitress and part time singer in a drag bar, Ally Campana/Maine. For me it made no difference. Bradley Cooper is a lot better known to me, through several roles but especially the first 'The Hangover' movie. With his long hair and wild beard Cooper was more or less unrecognisable. The story is more than well-known by now, yet again touching. Country-rock star modelled after many a U.S. star, from Springsteen to Black Crowes on the way down due to all sorts of excesses and a serious hearing problem, meets unknown singer by accident and tags her along to his entourage, brings her on stage, fall in love. She rises extremely fast, speeding up his (ultimate) down fall. Tears all over and an even higher flying career for the girl. Musically the movie was only interesting in the country-rock songs the two collaborate in on stage. The signature tune of Jackson Maine is your run of the mill country/southern rocker. All the Ally character does solo has nothing to do with the music she attracts the attention of her manager with in the first place but the modern dance/R&B stuff I do not give much for. It is in the interplay between the two stars, Sam Elliot's role and the banter of the father who keeps telling his Sinatra anecdote, where the movie succeeds. It is natural, it could just be real and that is the magic of good movies, as well as a great complement to all involved.